One of the first uses for InformaCast, and still one of the most popular is overhead paging. Whether it’s live audio or a prerecorded message, leveraging an audio system with IP speakers helps get the word out quickly. Every organization is different, which means the configuration for integrating overhead paging devices with InformaCast will vary depending on the design. 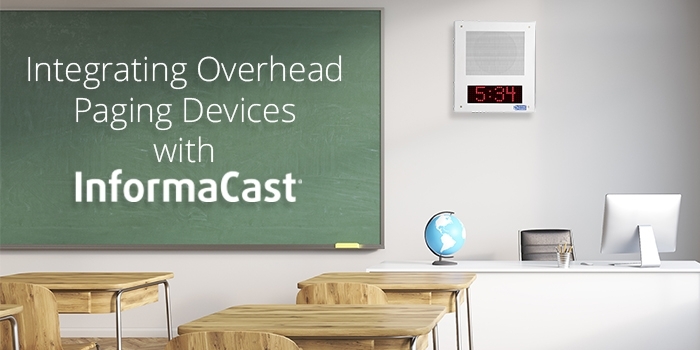 In this blog post, we’ll walk through different overhead paging integration design options for IP speakers, zone controllers, and the InformaCast Legacy Paging Interface. InformaCast compatible IP speakers are readily available from a number of vendors. IP speakers offer an efficient and flexible method for overhead paging integration. With InformaCast, IP speakers are automatically registered. Each speaker is considered an individual recipient that can be divided into zones based on where each is located in a building or campus. This can be done on a per-speaker basis or dynamically created using filters for IP addresses or subnets. IP speakers also put a minimal load on an organization’s network. Since IP speakers use the same multicast audio stream received by IP phones and InformaCast Desktop Notifier (IDN), a single 80 kbps, G.711-ulaw audio stream is all that is needed to send a message, regardless of how many speakers receive a broadcast. If an organization has analog speakers already in place, it may not want to spend the time and money to upgrade to IP speakers. If that is the case, there are still options for connecting InformaCast with overhead paging. By using an InformaCast-compatible zone controller, organizations can connect analog speakers with their network. The zone controller registers with InformaCast and has an audio line out that can then connect to existing paging amplifiers and analog speakers. Organizations using this method still get the benefit of using the same multicast audio stream as IP phones, IP speakers, and IDN. If an organization has an analog paging system, it is already set up to dial from a PBX or phone system. If that is the case, the integration work is already done, and there is likely a voice gateway with an FXS or FXO analog trunk integrated to a paging adapter and a paging amplifier. InformaCast can accommodate this kind of configuration as well with its Legacy Paging Interface plugin. The plugin places a SIP call to a phone system and calls the same extension phones dial to broadcast an overhead page. If an existing paging adapter has multiple zones that are selected via DTMF tones (e.g. press 1 for zone 1, 2 for zone 2, etc.) the Legacy Paging Interface can send the necessary digits. If users currently dial an extension to deliver an overhead page, that extension may benefit from being redirected to InformaCast using DialCast to trigger an overhead page. Users would also be able to assign a new extension to the analog paging adapter. In this way, an organization could use InformaCast to send audio to the existing analog speakers and any of InformaCast's other outputs like IP phones, email, digital signage and more. It’s important to note each SIP call that the Legacy Paging Interface makes sends a unicast RTP audio stream. This means that it does not scale as well as IP speakers or zone controllers. InformaCast can send a broadcast to 100s or 1000s of IP speakers or zone controllers because it only needs to send one audio stream onto the network, but the Legacy Paging Interface cannot reach that same scale as each device needs its own unicast audio stream. For more information, including links to more detailed configuration help, visit the Singlewire Support Community.